News / Sanae, Tenshi, Aya, Marisa, and Utsuho updated 12-25-14. Merry Christmas! No new character yet, but Sanae gets the update treatment now with significant changes to her gameplay. - Revamped Defense System that includes fixes and new features. - Improved combo system for greater combo ability. - Opponent will stay in knocked down state longer. - 50% Attack bonus decreased to 10%. - Removed 50% Defense bonus. - Helper/Projectile based attacks (except strikers) will now benefit from attack bonus. - Heavy versions of special attacks and some supers will behave differently in this mode. - Revitalizing Wind will have a shortened recovery time. - Revitalizing Wave will now spawn at opponent's location and will knock up. - Fortune Slip Bomb will now yield 3 bombs. - Esoterica will ignore the damage dampener. - Splitting of the Sea will have an additional wave on each side. - Heaven's Wind will have a piercing effect and will be able to hit multiple characters. - Decreased recovery after casting 9 Character Pierce, attack also has increased vertical/horizontal range, and decreased damage. - Splitting of the Sea recovery time decreased, helper spawn mechanism changed, added an additional wave on each side, damage decreased, fixed error where you would gain power. - Esoterica's damage increased and projectiles come out faster, fixed error where you would gain power. - Moses' Miracle can now be used in the air, fixed error where you would gain power. - Godhand (Suwako) is now a Lv2 Spellcard attack, damage increased, can OTG, and Sanae cannot move during the duration of the attack. 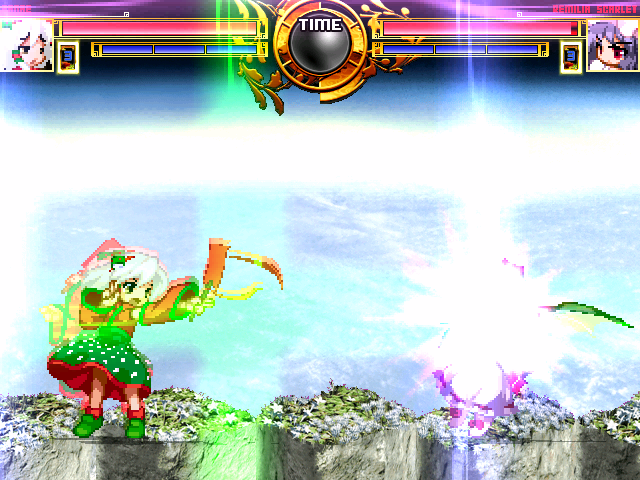 - Goddess thrust (Kanako) attack range increased, hitbox modified, and Kanako will now appear behind Sanae instead. - Light and medium versions of Revitalizing wave no longer knock down, has increased knock back, and slightly increased range. - Light version has reduced vertical range, but increased horizontal range. - Medium version has reduced vertical range. - Heavy version now throws out 2 bombs at different ranges, but delay has been increased before she actually throws out the bombs. - Reworked the RNG of Fortune Slip Bomb. - "Good Luck" will happen 50% of the time. - "Bad Luck" will happen 30% of the time. - "Very Bad Luck" will happen 15% of the time. - "Very Good Luck" will happen 5% of the time, damage of this version of the bomb has also been significantly increased. - There will now be an on screen indication of going under 30% life. - New win screen music. - Supers will now consume power on the first frame of animation. - Increased the speed of some basic attacks. - Additional changes and tweaks to the cmd file. - Made compatible with Akiha's Kemono wo Kogasu. - Revamped commands for most supers. - Fixes to dash and landing states. - Added envshakes for most attacks. - Changes and updates to the super portrait animations. - Changes and updates to the win screen. - New Level 3 Spell Card: Angled Final Spark. - Fixed a glitch where Final Spark would stay on screen when Marisa got hit out of the attack animation.